Animoto, online at animoto.com, offers a fast and easy way to create fun videos out of your favorite moments. 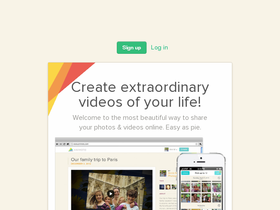 Animoto lets users upload and use their pictures, video clips, words, and music. Then Animoto uses the clips to create a cinematic beautifully produced video which users can share with their friends and family. Videos created from Animoto are great for all special occasions, including birthdays, weddings, or any moment you wish to share something special. But before you give life to all your old photos and videos, be sure to get all the latest animoto.com discounts, Animoto promotions, and Animoto coupon codes found here at RetailSteal.com. Get 2 free months of service from Animoto. Use this coupon code with a one year subscription to Animoto Pro. Click link to shop. Use this coupon code on Animoto to enjoy 2 free months of video slideshow maker. Save 50% on the monthly price of video service from Animoto when you sign up for a year subscription to Plus and Pro. Receive 2 free months when you purchase an Animoto Pro 1 year subscription. Click here for code. Shop at Animoto and enjoy $10 savings on annual subscription. Click here for code. Animoto will create a 30 second video from your pictures, video clips, and music for free with their Lite plan. Click here to get started. Hurry over to Animoto.com and save 20% discount on your monthly pro membership subscription with this coupon code. Shop for calendars starting at $19.99 at Mixbook.com. Click link to shop. The outlet store at MacMall.com offers savings of up to 60% on refurbished products. Click link and shop. Enjoy free ground shipping on your laptop order of $499 or more from Toshiba.com. Shop at Canvas People and save 30% on your order plus get free shipping with code. Click link now. Enjoy free shipping to all over the world on all orders when you shop at LighTake. Click the link to start saving. Use this coupon code to save 6% off your purchase plus get free shipping from 6Ave.com.